posts in this MSTC MT/AM recruitment 2018. 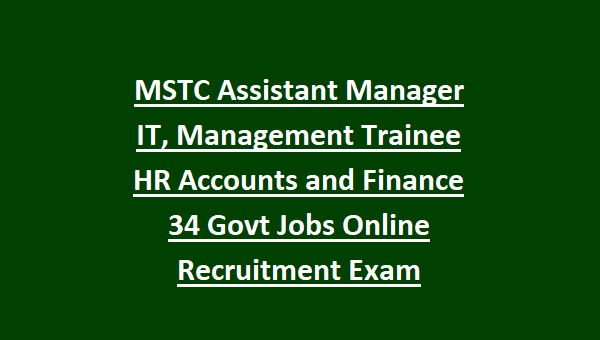 Candidates who are having necessary qualification and experience they can apply online for this MSTC India Management Trainee Jobs. Online applications for these MSTC India Asst Manager vacancies will be available from 12-05-2018 to 27-05-2018 through the MSTC official website of www.MSTCIndia.co.in. Candidates selection for this MSTC India Management Trainee Jobs will be based on written exam and interview. More details of MSTC India MT/AM 34 Govt Jobs Recruitment Exam Online Notification 2018 admit card date, exam date, qualifications, post wise vacancy and other details are given below. Exam Date or interview date and admit card released dates will be updated later. There are total 31 posts in this MSTC India recruitment 2018. Post Name and number of vacancies are given below. As on 01-05-2018 upper age limit for assistant manager jobs is 30 years and for MT jobs is 28 years. For reserved candidates age relaxations are applicable. For Assistant Manager Posts-B.E/B.Tech CS/IT or MCA or M.Tech CS/IT qualified candidates are eligible. For Management Trainee Posts-B.Com or CS/CA/ICWA or MBA qualification is required. For all the posts salary is - Rs.20600-46500/-. For general candidates and OBC candidates application fee is Rs.500/- and for SC/ST candidates and other candidates fee is Nil. Candidates selection will be based on written exam and interview for this MSTC India Recruitment 2018. For Exam pattern and syllabus refer official website of www.mstcindia.co.in website. Exam dates, admit card released dates also given in this website only. 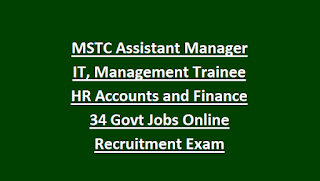 Online applications are accepted through www.mstcindia.co.in website for this MSTC recruitment of Management Trainee posts. Last date to apply online for this Assam MT/AM jobs is 27-05-2018.